Peat bogs and fens are important habitats that provide food and shelter for wildlife, help with flood management, improve water quality and play a part in climate regulation. The new funding will help deliver commitments in the Government’s flagship 25 Year Environment Plan to create a new ambitious framework for peat restoration in England. This vital work will abate and store an estimated 23,000 tonnes of carbon per year contributing to the UK’s climate change goals. 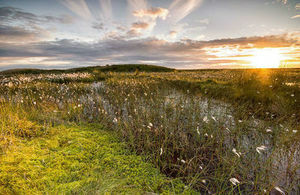 "Peatlands are an iconic aspect of the English landscape which are not only a haven for wildlife but also provide us with clean water and help reduce greenhouse gas emissions. The 25 Year Environment Plan sets out the Government’s commitment to improve peatlands and grant schemes such as this one will enable us to leave our environment better than we inherited it." "It’s fantastic to see peatlands on the Government’s agenda and getting the recognition they deserve – both in terms of the benefits they bring and the parlous condition we have let so many of them reach. I’m thrilled that our bid has been successful and I know I speak for all of our partners when I say I cannot wait to get started. "This funding will enable us to restore some of the most important and beautiful sites across the north of England – from England’s largest lowland raised bog in South Yorkshire all the way up to Northumberland’s highest point near the Scottish border – over 2,000 hectares of peatland will be repaired, locking up carbon, filtering our drinking water, managing flooding and providing habitat for some fascinating species." The focus is on 1,680 ha of upland peat across Bodmin Moor, Dartmoor and Exmoor. To date very little of the peatland on Dartmoor and Bodmin Moor has been restored. Exmoor has had over 1,900 ha of restoration to date. "This peatland grant from Defra presents a real opportunity to make a significant difference to deliver peatland restoration across Bodmin Moor, Dartmoor and Exmoor. "The peatlands of south-west England are very important for water quality, carbon storage, biodiversity, cultural history, recreation and farming but they are the most vulnerable in the UK to the impacts of climate change, due to their southerly position. Working with our partners in these three moors enables these nationally and internationally important habitats to be restored for the benefit of all and future generations." "The Mosses of Shropshire, Cheshire and Staffordshire are one of the least known, but most ecologically important, suites of peatbogs. Our partnership is delighted that this Defra funding will allow us to carry out even more work in our mission to restore them to favourable condition." "We are delighted to have been awarded this funding from Defra; helping to achieve an early win for Defra’s 25 Year Environment Plan. The project will deliver vital conservation work on more than 2,100 hectares of blanket bog in the UK’s original National Park. The work will help to reduce over 4,500 tonnes of carbon dioxide loss into the atmosphere every year. We are proud to play a role in helping to achieve the Government’s aspiring climate change targets. "As well as carbon storage, this innovative partnership project will provide a wealth of benefits to both people and animals. Work will help to improve the quality of the water that we consume; and enhance the precious home of rare birds and mammals. Bare peat re-vegetation and blocking eroded gullies on the moors will help to slow the flow of water when it rains; reducing the threat of flooding in local at-risk communities. The Partnership has a proven track-record of undertaking moorland conservation projects on such a large scale. We work together to help care for these stunning wild spaces that mean so much to so many people; and to ensure that they are protected for generations to come."